A feral cat found a perfect hideout when she gave birth to three kittens in a shrine “La Gruta de la Virgen” at The British School of Quito in Ecuador. The outlook is poor for feral cats in this country and concerned members of staff at the school, fearing the cats might be destroyed decided to move them to safety. The mother cat then hid her kittens under some old furniture and gardening tools at the back of the shrine and various staff members put food out for her. One of them, Maria lsabel Espinosa went one-step further, caught the mother and her babies, and took them back to her house in Quito. Having good sense, Maria lsabel immediately put the cats in a small bathroom and secured the window; she then set about finding advice on the internet and came across the CAT77 website with its detailed articles about caring for and taming feral cats. Needing to know more and get specific help and advice, she emailed us and over the next few weeks CAT77 remained in regular touch via email, to advise Maria Isabel how to tame and rehabilitate this family of cats. It soon became apparent that the mother cat – now named Nutmeg – was in fact tame but very nervous, the kittens however proved more difficult. Our first piece of advice, apart from confining the cats, was of course that Nutmeg, the mother cat, must in due course be spayed and that the people who rehomed the kittens must agree to have them neutered at five to six months of age. We then advised Maria lsabel to begin hand feeding the cats as soon as possible. Within a very short time Nutmeg became very tame, in addition, within a week, one kitten was quite happy to approach Maria lsabel and her daughters for food. A friend had offered to take this kitten and he went to his new home at eight weeks, together with instructions on how to continue with the taming process. Maria lsabel decided to keep Nutmeg. After another four weeks, both remaining kittens were happy to be hand fed and stroked, although they remained nervous, particularly the tortoiseshell. Maria Isabel and her family decided to keep Nutmeg and one of the kittens was to be rehomed with a cat-loving family nearby. Maria lsabel had contacted the PAE (Animal Protection of Ecuador), who would vaccinate and neuter the cats. 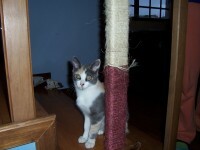 Nutmeg went to be spayed three months after the birth of her kittens. We were surprised that the PAE also wanted to neuter the kittens a few days later, as they were barely twelve weeks of age. The vet explained that their policy is to neuter as early as possible, as people just do not get their animals spayed in Ecuador so this ensures that every animal is rehomed already neutered. 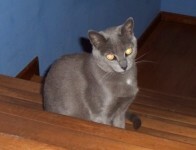 The operations went well however, and Maria lsabel collected all three drowsy cats and returned home. A few days later, the black and white boy went to his new home, leaving Nutmeg with one remaining kitten. Within a week of her spay, Nutmeg was showing signs of wanting to venture out of the bathroom where the family had confined her; however, Maria lsabel has two dogs and she was worried that this would be a problem. Again, we emailed step by step advice about how to integrate the cats and dogs and one day we received an email to say Nutmeg was tiptoeing past both dogs whilst they were fast asleep! The family had now decided to keep the tortoiseshell kitten as well as she was proving very slow to respond to the hand feeding, remaining nervous and often hiding away. She was named Mopsy. Following her vaccinations, Mopsy became ill, off her food and generally low. The vet at the PAE said it was most likely side effect of the rabies vaccinations. Maria lsabel took advantage of this and handled Mopsy a lot while she was off colour. This seemed to be a turning point for her and gradually she gained confidence. She remains quite a character though. The family have wrapped sisal rope around one of the large wooden columns in their house where she climbs right up and touches a bell at the top! Ten months after their rescue, Nutmeg and her family – Mopsy, Leo and Alvin – were all in loving homes. A member of staff at the PAE has asked if they can translate one of our articles for their own use, as they have no information about feral cats there, so let us hope this is a step towards a better understanding of the plight of these poor animals in Ecuador. Although this story took place a year or two ago, it is worth repeating as it demonstrates how, with expert help and advice, anyone can tame a feral cat (and with email, it can be done even if they live on the other side of the world! ).